The next wall to work on in the craft room is the wall with the window. It will include a gift wrapping cabinet, a bench seat with storage and another tall cabinet for fabric. 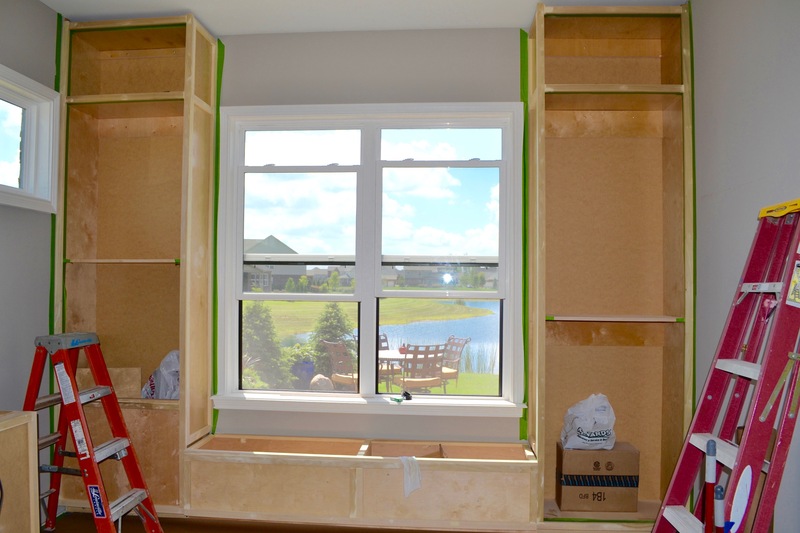 The first cabinet to build is the cabinet for wrapping paper and supplies. I wanted a partition between Christmas and all occasion wrapping paper. I have a slight obsession with wrapping paper. #sorrynotsorry #homegoodslove and I no longer want to have to haul up a bin of Christmas paper from the basement. You never know when you might want to wrap a Christmas gift in August! I knew I wanted to hang spools of ribbon in every color in there and have storage for bows and tags. I had to really think about this one and it was a difficult build. I wasn’t sure how to do it, because of the partition, so Sandra explained the process to me….and then I did it! #allbymyslef I did all of the measurements by myself and that was a challenge because I had to take into account the storage bench seat and the other cabinet on the other side of the window. For a while I was calling and texting Sandra at every little turn, triumph or set back. Wood is a natural element and has a mind of its own. I got this cabinet built and installed and it leans too far to the left. It is slight and MAYBE you can’t see it, but it was devastating for a few different reasons. The lean will absolutely effect everything else like the shelves and doors so I had to take it apart a few times, recut a piece but it finally came together and I was really happy! I moved onto the cabinet on the right side of the window. It was just like building the cabinets on the other side of the room so I was now familiar with the process. Nothing special. I built it, squared it up and got it on top of the base. I then moved on to window seat. Now, I was really apprehensive about building the bench seat because I had to figure out how to make the top. I am usually a “fly-by-the-seat-of-my-pants” kind of girl, but with this project I wanted to process the approach A LOT before I actually took on the task. While I processed the next build, I cleaned every room in the house from top to bottom. Did every bit of laundry there was to do. When there was nothing left to be done, and I couldn’t put it off any longer, I decided to get into it! First, I built the smaller cabinets that would sit on top of the 8′ cabinets that flank the windows leaving room for crown moulding because, come on, who doesn’t love crown moulding?! They were really easy to build relative to other things in the room! It was now absolutely time to move on to the bench seat. I made two cabinets to hold different things and so I will have two independent bench seat tops. Those will be made later. I added the face-frames, filled in the holes and taped it all off to be painted. After all of that planning, I was really pleased with the outcome! Added bonus, my house was clean.